How to have a magnetic personality. This is one dangerous site. Retroplanet.com has way too much scooter stuff all packed into it with reasonable prices. 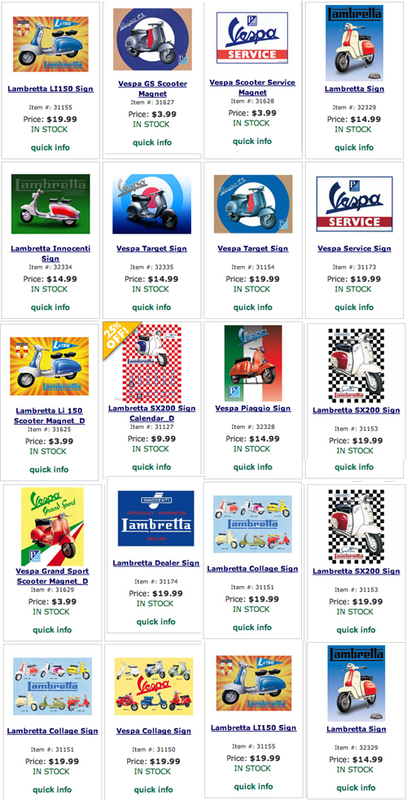 You can order tin signs as well as magnets for both Lambretta and Vespa. Prices range from $3.99 to $19.99. To see all their scooter stuff, click here. Thanks to Daniel S. for this find! This entry was posted in Art, Decor, Miscellaneous and tagged lambretta, logos, magnets, metal sign, scooter, tin sign, vespa, Vintage Advertising by Tracy. Bookmark the permalink.